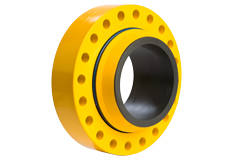 The Oil States Swivel Ring Flange (SRF) is the most commonly used flange for shallow water pipeline repairs. The SRF allows the diver to line up bolt holes with the mating weld neck flange. This significantly reduces the time needed to complete the repair operation. See swivel ring flange animation here.